My mom recently sent me a copy of The Last Lecture, a book based on the inspiring talk given by Carnegie Mellon professor Randy Pausch a few months before he passed away. I particularly remember him starting the talk with push-ups; a poignant introduction to the topic of terminal illness. The Last Lecture was one of the first books we tested on the Barcode Scanner application, a new searching tool available for download on Android-powered phones. Here's how it works: when you open up the application, the screen will show what the phone's built-in camera is seeing. 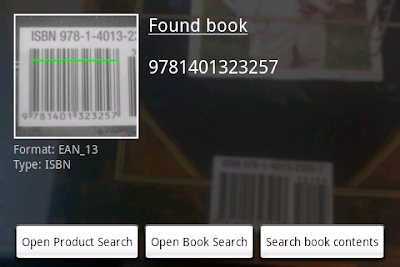 When you line up the camera in front of a book barcode, it will automatically zoom, focus and scan the ISBN - without you even needing to click the shutter. As you can see below, you'll then have the option search the full text of the book on Google Book Search right away. 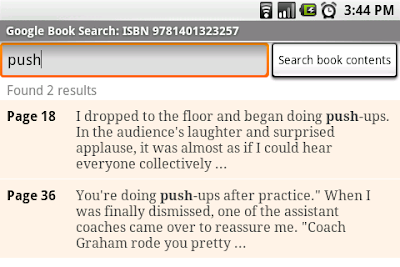 Here, I'm searching for push to find all the pages that mention push-ups, and they're displayed below the search box. For students, this could be an easy way to locate that critical passage that the professor was talking about in lecture. Or if you're browsing through the shelves of a bookstore, you could use this application to easily determine whether a book contains the information you're looking for. This is the first release of this program, so there may be some hiccups. Most of the books supported by this tool were printed in the mid-1990s or later, because it took some time for ISBN barcoding standards to stabilize. And of course, not every book is on Google Book Search. Yet even with these limitations, it's a lot of fun to search through a paper book using your mobile device, and I think the tool opens up new ways to experience printed works. I like your blog imagination.This is one of the excellent post.I like your blog Instructions.